With the new tax law in effect, most Americans are expecting a different experience with their 2018 tax return—and boy, what a difference a year makes. According to the Internal Revenue Service, not only had more Americans already filed their taxes by this time last year (more than 94 million in 2018 versus 92 million in 2019) but more had received refunds. At this point in 2018, nearly 74 million taxpayers had received a refund. In 2019 so far, only about 71 million Americans have received a refund. Though fewer people are receiving refunds, the refund amount hasn’t changed much. In 2018, the average refund was $2,893. In 2019, the average refund is $2,873. Anecdotal evidence on social media shows many more folks are having to pay taxes this year after filing their return versus getting a refund last year. IRS stats on the amount it has “spent” on refunds this year backs that up. In 2018, the IRS paid more than $212 billion in refunds. So far in 2019, the IRS has paid $206 billion in refunds. Keep in mind that getting a refund means that you’ve given the government a short-term loan. If you’d rather not loan the government money and can live with a smaller refund in the future, talk to your tax specialist about how to adjust your withholdings going forward. Tax stats aside, you can find some good news related to Tax Day 2019. Plenty of restaurants and brick-and-mortar businesses are offering Tax Day deals for 2019. This might be for a Tax Day freebie or special pricing that captures tax-related numbers (i.e. $10.40 for the 1040 tax form). Below I’ve gathered together all the deals that are available in-person, nationwide or in multiple states. Up first are the Tax Day freebies. There are seven freebies. After that I’ve listed the Tax Day specials with clever pricing. There are five special pricing offers. Unless specified otherwise, all deals are good on April 15, 2019 only. Brands are listed in alphabetical orders. Get your choice of a free green or grain bowl or burger simply by downloading the new B.GOOD app. Already have the app? Score free fries with any purchase. Offer valid at participating B.GOOD locations, which are in more than a dozen states. In honor of Tax Day, everyone is invited to visit their local Bananas Smoothies & Frozen Yogurt for a sweet treat: a free small frozen yogurt! To redeem, just mention the offer at time of purchase. This Tax Day freebie runs April 15-17. 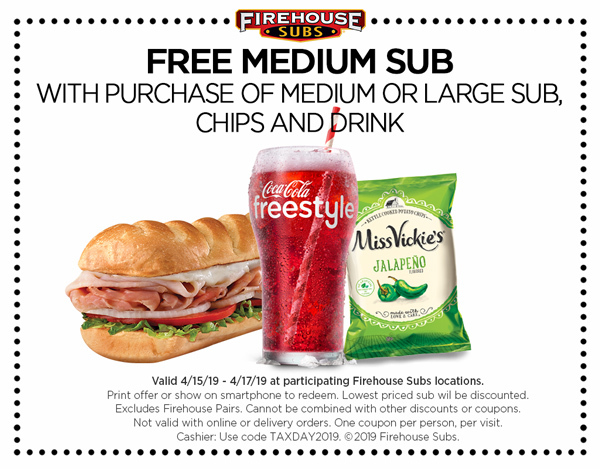 Firehouse Subs will give you a free medium sub when you buy a full price medium or large sub, chips and a drink. See coupon in this link. You’ll need to get up early to get Hardee’s Tax Day freebie. From 7 to 10 a.m., you can get a free Sausage Biscuit. All Planet Fitness locations are offering a free HydroMassage during tax week, April 11-20. The promotion is available via a downloadable coupon. Membership is not required. If your club does not offer HydroMassage, the coupon is valid for a free chair massage instead. Potbelly Sandwich Shop’s Tax Day deal is a BOGO—Buy One Sandwich, Get One Free of equal or lesser value all day! To redeem, Potbelly Perks members can use their Potbelly Perks account and non-Perks members can tell the cashier it is Tax Day when at check out. Schlotzsky’s is giving away one free small The Original sandwich with the purchase of a medium-sized drink and chips. Applicable at all locations nationwide—that’s more than 350 stores in the U.S.